Eagles Nest offers you endless opportunities for summer fun with its prime location. This bright, spacious home is situated on protected Middle Bay. Enjoy the cove’s calm waters, sip a drink from the floating dock or dine on the deck. The westerly view will have you home before the sun goes down. The scenic, wooded setting is very private, yet you are only 6 miles from Brunswick and Bowdoin College. Eagles Nest is a 3 bedroom 3 1/2 bath home, totally renovated in 2010. A fully stocked kitchen with cherry cabinets, granite countertops, and Viking appliances opens into an airy, sunlit living space. The main living area’s west wall is composed entirely of screened, sliding glass doors, opening to the second story 670 sq. ft. deck. The ground level offers a guest bedroom complete with its own patio, a family room, a private office, as well as a full bathroom and laundry room. Spend the day relaxing on your private dock, or kayak* the inviting waters to spot the curious seals. Hiking and biking trails abound in the Harpswell area. Stroll to The Vegetable Corner or The Schoolhouse Café to buy fresh produce or your breakfast, only a 10 minute walk. Explore the nearby, beautiful coastal towns of Brunswick, Orr’s Island and Bailey’s Island. Eagles Nest is the perfect home for your summer vacation to just relax or have a coastal adventure. Create memories to last a lifetime this summer. Sorry, no pets allowed at this property. * Property is not supplied with boats and kayaks. Please look under the local area guide tab for boat rentals. Kayak delivery is available. Eagles Nest is an updated, right-sized house, with great views and a convenient location. 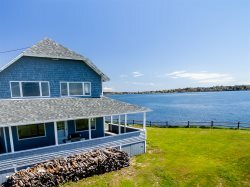 It's well-appointed, private, yet convenient to the amenities of Harpswell Island and Brunswick. Would definitely try to stay here on our next trip to Maine! This house is extremely well equipped, in a terrific location! Next time I will stay a month!